Designing and deploying size-reduction systems takes experience. Many people can collect and install some of the pieces they feel are needed to create a working system, but experience with the interrelationships between components is harder to find. And to ensure safety and performance, crushing, screening, storage and handling systems need to be professionally engineered. A system is always more than just a collection of parts; they must work together whether it’s a properly designed chute or an elaborate processing plant. Retrofitting new crushers, conveyors, screens or other pieces of equipment is also not always an easy process. Even if drawings and specifications no longer exist, plant designers need to make sense of what is there and know what it takes to make new pieces fit in an existing puzzle. If continuing production during the upgrade is required, system bottlenecks will need to be prevented. For example, raw material or finished product stockpiles may be required to keep downtime to a minimum. Also, access and space requirements need to be confirmed and double-checked. Engineering and expertise in a variety of areas are required to develop size reduction systems, including: crushing, screening, structures, conveyors, chutes, hoppers, dust collection and storage, whether for a small equipment retrofit or a large turnkey facility. CAD and process design software applications are must have. Limit multiple layers of personnel. Work directly with the engineers and personnel to select the equipment and design the system. Project management, installation, scheduling and tracking experience will be needed. Be sure supervisors and installers are MSHA trained and have experience in fieldwork. While most projects present new challenges, a widely experienced team will bring in ideas from other industries. Typical projects involve the following processes and types of equipment. This can be a feed hopper with an apron feeder, belt feeder, vibratory or screw feeder, truck dump or railcar unloading system. Designing, building or procuring belt conveyors, stackers, apron conveyors, screw conveyors, and pneumatic handling conveyors. 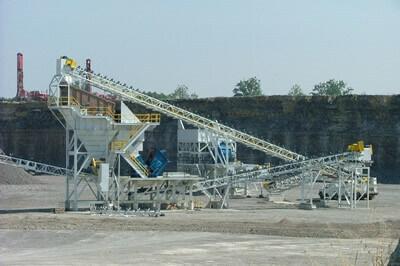 Crushing is the basic building block of a size-reduction system. 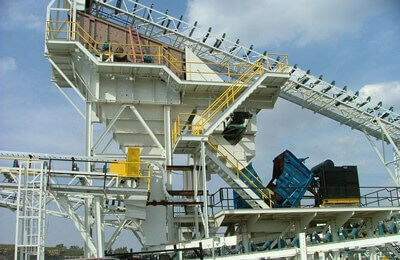 Experience with a large range of crushing equipment offers many solutions. Properly feeding material into the crusher greatly increases its efficiency, contributes to even wear and maximizes wear metal costs. Specifying, providing and installing a range of silos, hoppers or other bulk storage solutions. Experience with many screening manufacturers to include the right screening solution into the system. Including the proper dust collector and dust collection system is a key component to allow a crushing system to work properly. Experience with many dust collection vendors will facilitate properly sizing, connecting and installing the best dust-collection system solution. To make sure that all components of a system work together, work with control system engineers, panel builders and electrical contractors to create a working, integrated system. Design, procurement and specifications for buildings, foundations and structures for the equipment supplied on any system. Every project has a different set of circumstances that are unique to it. Try to follow a simple checklist to ensure the best possible solutions to the problems. Crusher and screening testing as required. Define required scope for the system. Create preliminary concepts and drawings. Review with operators and supervisors. After receiving feedback, fine-tune the drawings, concepts and put forth a detailed proposal. Set up kick off meetings as required. Proceed with the purchase of major components. Proceed with a detailed system arrangement. Assemblies put out for detail drawing creation. Drawings are self-checked and then crosschecked for accuracy. Assemblies are re-entered into system layout from detail assemblies to verify fit. Approval drawings sent out as required. Vendor drawings checked and approved. Items checked as they are received. Work with vendors and shipping to verify shipment accuracy. Pictures are taken of all shipments for record purposes. Installation supervisor works with install crew to identify, locate and erect items as needed. As installation finish date nears, begin check of motor rotations, sensors etc. Final customer acceptance – formal reviews to finalize “punch list,” follow up items and document the system is performing as specified. A limestone quarry running since the 1950s and producing 500,000 tons per year wanted to increase yearly production capacity up to 1.5 million tons with a new automated plant. The new design needed to have the capability to stockpile hundreds of thousands of tons of finished product. The focus was on creating a state-of-the-art plant with designed-in flexibility to do different product sizing. The automated plant needed to have the ability to run production all day as well as to be able to change the product sizes within 10 minutes. The design and fabrication of a new plant may take up to two years to complete as each idea is considered and "wish lists" are sorted out. You don’t want to come back and say we should have done this or done that. Get the very best of everything you can get into the plant for longevity. The project will include numerous conveyors, sensors, controls, vibrating screens, feeders and other equipment. Installed electronics and control systems feed a programmable logic controller. Each conveyor at the plant is equipped with terminal strips that are all wired to communicate information to one main processor, bringing all of the information together in one place to make it easy to operate. All of the feeders and conveyors are monitored to collect all of the information required to operate the plant. With the ability to monitor the speed of the conveyors and feeders, the quarry can keep an eye on production and troubleshoot maintenance issues. The reason for having an automated control system is that if something goes wrong on one of the conveyors, you’ll see it fast enough to prevent a catastrophe that might require digging out a conveyor. If something does go wrong, the computer can take over and begin dropping conveyors, discharging material and shut the feeder down. Since the quarry can now monitor the conveyors moving, the speeds and the tons per hour, limitations can be set to help catch problems before they become too serious. If something is going wrong, say conveyor 2A is slowing down, you can put limits on how much you want to allow it to slow down before the feeder is paused and then limit how long that feeder stays paused. 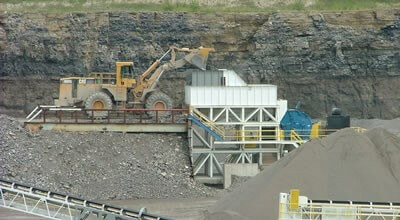 In the end, the quarry was able to more than double their production capacity with the help of the automated plant. The plant was built, delivered and installed as planned with no problems. This is an ideal situation if a quarry is sitting on huge reserves of limestone and plans to operate the crushing plant well into the future. Projects such as this are successful when the customer’s needs are defined and understood, and the project team – including the customer and all supplier partners work to accomplish the project goals.